What does C-RISTA stand for? 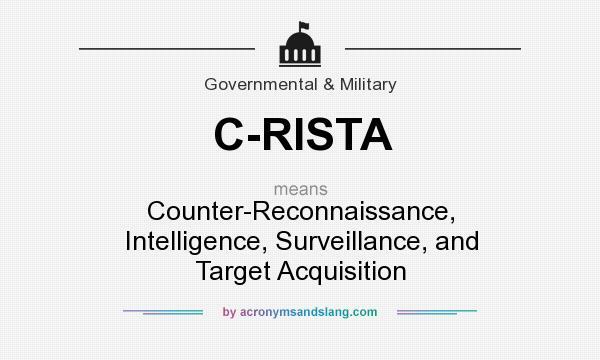 C-RISTA stands for "Counter-Reconnaissance, Intelligence, Surveillance, and Target Acquisition"
How to abbreviate "Counter-Reconnaissance, Intelligence, Surveillance, and Target Acquisition"? What is the meaning of C-RISTA abbreviation? The meaning of C-RISTA abbreviation is "Counter-Reconnaissance, Intelligence, Surveillance, and Target Acquisition"
C-RISTA as abbreviation means "Counter-Reconnaissance, Intelligence, Surveillance, and Target Acquisition"